1. Clayman RV, Kavoussi LR, Soper NJ, et al. Laparoscopic nephrectomy: initial case report. J Urol 1991; 146:278-282. 2. Batler RA, Campbell SC, Funk JT, Gonzalez CM, Nadler RB. Hand-assisted vs. retroperitoneal laparoscopic nephrectomy. J Endourol 2001; 15:899-902. 3. Nelson CP, Wolf JS. Comparison of hand assisted versus standard laparoscopic radical nephrectomy for suspected renal cell carcinoma. J Urol 2002; 167:1989-1994. 4. Gill I, Strzempkowski B, Kaouk J, et al. Prospective randomized comparison: transperitoneal vs retroperitoneal laparoscopic radical nephrectomy. J Urol 2002; 167:abstract 78. 5. Baldwin DD, Dunbar JA, Parekh DJ, et al. Single-center comparison of pure laparoscopic, handassisted laparoscopic, and open radical nephrectomy in patients at high anesthetic risk. J Endourol 2003; 17:161-167. 6. Kercher KW, Joels CS, Matthews BD, Lincourt AE, Smith TI, Henriford BT. Hand-assisted surgery improves outcome for laparoscopic nephrectomy. Am Surg 2003; 69:1061-1066. 7. Wolf JS Jr. Hand-assisted laparoscopy: pro. Urology 2001; 58:310-312. 8. Okeke AA, Timoney AG, Keeley FX Jr. Hand-assisted laparoscopic nephrectomy: complications related to the hand-port site. BJU Int 2002; 90:364-367. 9. Gill IS. Hand-assisted laparoscopy: con. Urology 2001; 58:313-317. 10. Wolf JS Jr., Moon TD, Nakada SY. Hand assisted laparoscopic nephrectomy: comparison to standard laparoscopic nephrectomy. J Urol 1998; 160:22-27. 11. Stifelman M, Nieder AM. Prospective comparison of hand-assisted laparoscopic devices. Urology 2002; 59:668-672. 12. Lee SE, Ku JH, Kwak C, Kim HH, Paick SH. Hand assisted laparoscopic radical nephrectomy: comparison with open radical nephrectomy. J Urol 2003; 170:756-759. 13. Gill IS, Cherullo EE, Meraney AM, Borsuk F, Murphy DP, Falcone T. Vaginal extraction of the intact specimen following laparoscopic radical nephrectomy. J Urol 2002; 167:238-241. 14. Matin SR, Gill IS. Modified Pfannenstiel incision for intact specimen extraction after retroperitoneoscopic renal surgery. Urology 2003; 61:830-832. 15. Chen YT, Yang SSD, Hsieh CH, Wang CC. Hand port-site metastasis of renal-cell carcinoma following hand-assisted laparoscopic radical nephrectomy: case report. J Endourol 2003; 17:771-773. 16. Dunn MD, Portis AJ, Shalhav AL, et al. Laparoscopic versus open radical nephrectomy: a 9-year experience. J Urol 2000; 164:1153-1159. 17. Portis AJ, Yan Y, Landman J, et al. Long-term followup after laparoscopic radical nephrectomy. J Urol 2002; 167:1257-1262. 18. Chan DY, Cadeddu JA, Jarret TW, Marshall FF, Kavoussi LR. Laparoscopic radical nephrectomy: cancer control for renal cell carcinoma. J Urol 2001; 166:2095-2100. 19. Saika T, Ono Y, Hattori R, et al. Long-term outcome of laparoscopic radical nephrectomy for pathologic T1 renal cell carcinoma. Urology 2003; 62:1018-1023. 20. Makhoul B, De la Taille A, Vordos D, et al. Laparoscopic radical nephrectomy for T1 renal cancer: the gold standard? A comparison of laparoscopic vs open nephrectomy. Br J Urol Int 2004; 93:67-70. 21. Shuford MD, McDougall EM, Chang SS, LaFleur BJ, Smith JA, Cookson MS. Complications of contemporary radical nephrectomy: comparison of open vs laparoscopic approach. Urol Oncol 2004; 22:121-126. 22. Cadeddu JA, Ono Y, Clayman RV, et al. Laparoscopic nephrectomy for renal cell cancer: evaluation of efficacy and safety: a multicenter experience. Urology 1998; 52:773-777. 23. Ono Y, Kinukawa T, Hattori R, et al. Laparoscopic radical nephrectomy for renal cell carcinoma: a five year experience. Urology 1999; 53:280-286. 24. Barrett PH, Fentie DD, Taranger LA. Laparoscopic radical nephrectomy with morcellation for renal cell carcinoma: the Saskatoon experience. Urology 1998; 52:23-28. 25. Janetschek G, Jeschke K, Peschel R, Strohmeyer D, Henning K, Bartsch G. Laparoscopic surgery for renal cell carcinoma: radical and partial nephrectomy. J Endourol 2000; 14(7 suppl):A45. 26. Chatterjee S, Nam R, Fleshner N, Klotz L. Permanent flank bulge is a consequence of flank incision for radical nephrectomy in one half of patients. Urol Oncol 2004; 22:36-39. 27. Javidan J, Stricker HJ, Tamboli P, et al. Prognostic significance of the 1997 TNM classification of renal cell carcinoma. J Urol 1999; 162:1277-1281. 28. Tsui K-H, Shvarts O, Smith RB, Figlin RA, deKernion JB, Belldegrun A. Prognostic indicators for renal cell carcinoma: a multivariate analysis of 643 patients using the revised 1997 TNM staging criteria. J Urol 2000; 163:1090-1095. 29. Fentie DD, Barrett PH, Taranger LA. Metastatic renal cell cancer after laparoscopic radical nephrectomy: long-term follow-up. J Endourol 2000; 14:407-411. 30. Castilho LN, Fugita OEH, Mitre AI, Arap S. Port site tumor recurrences of renal cell carcinoma after videolaparoscopic radical nephrectomy. J Urol 2001; 165:519. 31. Castilho LN, Fugita OEH, Mitre AI, Arap S. Report site recurrences of renal cell carcinoma after videolaparoscopic radical nephrectomy. J Urol 2001; 166:629-630. 32. Landman J, Clayman RV. Report site tumor recurrences of renal cell carcinoma after videolaparo-scopic radical nephrectomy. J Urol 2001; 166:629-630. 33. Urban DA, Kerbl K, McDougall EM, Stone AM, Fadden PT, Clayman RV. Organ entrapment and renal morcellation: permeability studies. J Urol 1993; 150:1792-1794. 34. Nakada SY. Editorial comment for: Hand port-site metastasis of renal-cell carcinoma following hand-assisted laparoscopic radical nephrectomy: case report. J Endourol 2003; 17:774. 35. Gill IS, Kavoussi LR, Clayman RV, et al. Complications of laparoscopic nephrectomy in 185 patients: a multi-institutional review. J Urol 1995; 154:479-483. 36. Siqueira TM Jr., Kuo RL, Gardner TA, et al. Major complications in 213 laparoscopic nephrectomy cases: the Indianapolis experience. J Urol 2002; 168:1361-1365. 37. Patel VR, Leveillee RJ. Hand-assisted laparoscopic nephrectomy for stage T1 and large stage T2 renal tumors. J Endourol 2002; 17:379-383. 38. Cicco A, Salomon L, Hoznek A, et al. Results of retroperitoneal laparoscopic radical nephrectomy. J Endourol 2001; 15:355-359. 39. Wille AH, Roigas J, Deger S, Tullmann M, Turk I, Loening SA. Laparoscopic radical nephrectomy: techniques, results, and oncologic outcome in 125 consecutive cases. Eur Urol 2004; 45:483-489. 40. Walther MM, Lyne JC, Libutti SK, Linehan WM. Laparoscopic cytoreductive nephrectomy as preparation for administration of systemic interleukin-2 in the treatment of metastatic renal cell carcinoma: a pilot study. Urology 1999; 53:496-501. 41. Mosharafa A, Koch M, Shalhav A, et al. Nephrectomy for metastatic renal cell carcinoma: Indiana University experience. Urology 2003; 62:636-640. 42. Desai MM, Gill IS, Ramani AP, Matin SF, Kaouk JH, Campero JM. Laparoscopic radical nephrec-tomy for cancer with level I renal vein involvement. J Urol 2003; 169:487-491. 43. Savage SJ, Gill IS. Laparoscopic radical nephrectomy for renal cell carcinoma in a patient with level I renal vein tumor thrombus. J Urol 2000; 163:1243-1244. 44. McDougall EM, Clayman RV, Elashry OM. Laparoscopic radical nephrectomy for renal tumor: the Washington University experience. J Urol 1996; 155:1180-1185. 45. Hsu TH, Jeffrey RB Jr., Chon C, Presti JC Jr. Laparoscopic radical nephrectomy incorporating intraoperative ultrasonography for renal cell carcinoma with renal vein tumor thrombus. Urology 2003; 61:1246-1248. 46. Sundaram CP, Rehman J, Landman J, Oh J. Hand assisted laparoscopic radical nephrectomy for renal cell carcinoma with inferior vena caval thrombus. J Urol 2002; 168:176-179. 47. Fergany AF, Gill IS, Schweizer DK, et al. Laparoscopic radical nephrectomy with level II vena caval thrombectomy: survival porcine study. J Urol 2002; 168:2629-2631. Department of Urology, Loyola University of Chicago, Chicago, Ilinois, U.S.A.
1. Will it be widely available? 2. How does a clinician retain the necessary skills to perform it safely and effectively? 3. Are decisions concerning the appropriateness of nephron-sparing surgery versus laparoscopic nephrectomy being made appropriately? 4. What are the limits of laparoscopic nephrectomy; is it indicated for large or high-stage cancers? In this excellent review, Drs. Kim and Clayman have detailed the current experience with the various laparoscopic approaches to nephrectomy. As with many other areas of emerging practices, the real problem with comparative analyses of techniques is patient selection. Comparing "contemporary" series of open and laparoscopic cases or even cases of hand-assisted versus pure laparoscopy, even when patients are "matched" for tumor size, etc., by definition excludes the thought process that caused the surgeon to select one technique over another. This being said, there does not seem to be a disadvantage in terms of cancer management of organ-confined renal cancers when laparoscopic nephrectomy is used. What are the limits of this technique? Recent experience suggests that in very experienced hands, large tumors (greater than 7 cm) can be treated with similar complication rates as that seen in smaller tumors. The real issue for the individual surgeon is to know his/her limits, i.e., patient selection is imperative. Given the facts that (i) the average urologist currently performs one to two nephrectomies per year and (ii) urology does not have a "commonly performed" laparoscopic procedure (e.g., cholecystectomy in general surgery practice), how does a surgeon, even one who is adequately trained, maintain competency in laparoscopy nephrectomy? It seems that the only realistic answer to this problem is referral of these procedures to experienced laparo-scopically trained urologists inside or outside of one's practice. Another area of concern is the dilemma of nephron-sparing surgery versus laparoscopic total nephrectomy. To date, nephron-sparing surgery seems to provide equal oncologic value in selected patients with localized renal cancer. What are the appropriate limits of nephron-sparing surgery and is it better for the patient to undergo a laparoscopic total nephrectomy or open nephron-sparing surgery? Patient selection, based on the depth of tumor involvement of the kidney, patient age, comorbidities, etc., is the key. Again the physician's self-judgment of his/her ability to perform any procedure safely and effectively should direct the approach used. Finally, what limits should we apply to laparoscopic nephrectomy? Recent data from institutions with a wide experience with laparoscopic nephrectomy suggests that tumors greater than 7 cm in diameter can be removed with similar safety (complication rates, blood loss, length of stay, etc.) 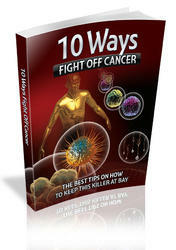 as is seen with smaller tumors. On the other hand, when large tumors involve extension to adjacent organs, blood vessels, and/or lymphatics, laparoscopic techniques probably are not currently indicated. 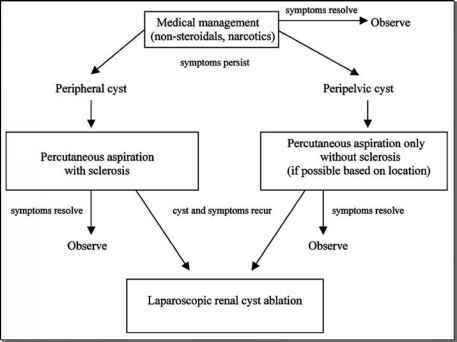 In summary, although laparoscopic nephrectomy is a gold standard (along with open nephrectomy and nephron-sparing surgery) for the management of localized renal cancers, it cannot be said too often that patient selection and an honest appraisal of one's expertise with any procedure is the key to management. The surgical approach to removal of renal tumors is, and will continue to be, a moving target, as new techniques and systemic therapies are developed. It would seem clear that the urologic community should embrace research, which will yield less invasive, more effective therapies for this disease, which kills over 10,000 Americans annually.